I'm not afraid to hide the fact that I will happily indulge in a hot slice of Papa John's or Domino's pizza every once in a while. After a long day of work, sometimes the last thing on my mind is making dinner. In those rare instances, a to-your-door-in-thirty-minutes pizza will suffice. But homemade pizza is still my ultimate love. I like experimenting with different types of pizza. 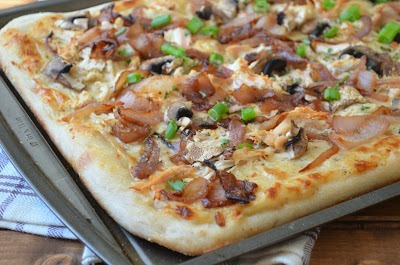 Homemade BBQ Chicken Pizza is one of my favorites, but this past time I decided to try something different and wanted to experiment with a white sauce. Simmering milk and Parmesan cheese makes a delectable coating for the crust. 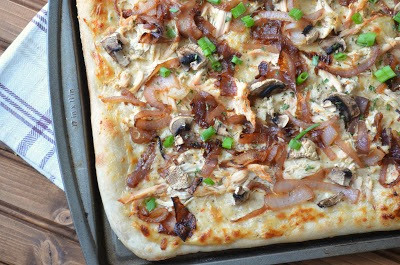 Topped with caramelized onions, shredded chicken and mushrooms, this pizza immediately shot to the top of my "favorites" list. Enjoy! Preheat oven to 450 degrees F. Sprinkle cornmeal over a baking sheet. Roll out the pizza dough so it is the same size as the baking sheet. Transfer the dough to the baking sheet and set aside. Melt 1 tbsp. butter in a medium saucepan. Add sliced onion and cook over medium heat, stirring often, until onions are softened and caramelized. Remove from heat and set aside. Meanwhile, melt remaining 1 tbsp. butter in another saucepan over medium heat. Add garlic and cook 30 seconds, stirring constantly. Add flour, salt and pepper. Stir constantly with a whisk for 1 minute. Continue stirring while gradually adding the milk. Whisk until sauce begins to thicken, about 3 minutes. Turn off heat and add Parmesan cheese and red pepper flakes. Stir until cheese melts. Spread the cheese sauce over the dough, leaving a 1/2-inch border. 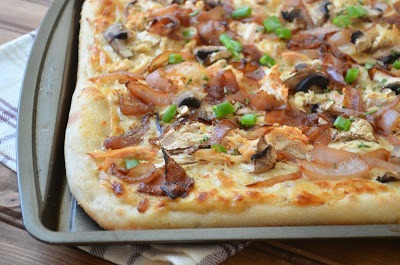 Top with chicken, mushrooms and caramelized onions. Bake on bottom oven rack for 17 minutes or until crust is golden. Sprinkle with oregano, scallions and parsley. Serve.